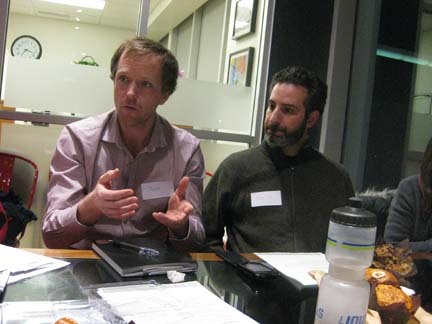 Cycle Toronto Executive Director, Jared Kolb, and Ward 21 advocacy group member Simon Strauss. Cycle Toronto's ward advocacy groups help Cycle Toronto provide a unified voice for all cyclists or all ages all across the city. Ward 21 (St. Paul's) recently relaunched their regular group meetings and new dandy contributor Amanda Lewis was there to provide this report to dandyhorse. 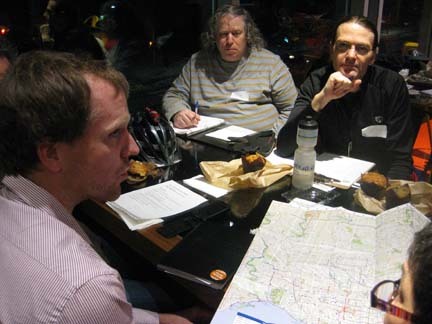 Eleven cyclists gathered at Loblaw’s on St. Clair Avenue West at Bathurst Street on Thursday, January 9th, to create a Ward 21 Organizing Committee, with the ultimate goal of making Ward 21 the “most bike-friendly ward” in the city. 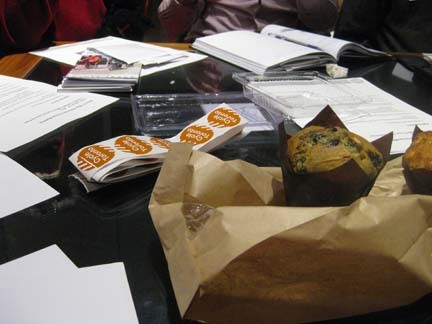 With muffins on the table and a man playing show tunes on the grand piano in the upstairs foyer, the meeting had a fine start. Jared Kolb, Executive Director of Cycle Toronto, kicked things off. He explained Cycle Toronto’s ward advocacy program and why it is essential for members to come together to push for change at City Hall. When we assemble as ward-organizing teams, we can share the load and inspire each other, and increase participation through group rides and social media outreach. 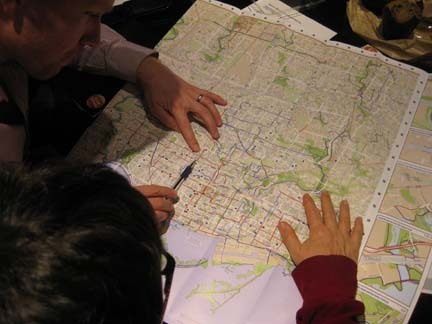 Cycle Toronto has 21 active ward advocacy groups across the city (there are 44 wards), and it needs 23 wards—what Jared called “the magic number”—to pass a motion at council. Ward groups can collaborate on inter-ward issues. Wards 21 and 22, for example, have been working together to prioritize the intersection of Old Park Road and the Beltline Trail. They have also been advocating for the installation of bike lanes on Eglinton Avenue, thereby establishing an east-west corridor along a major arterial aligned with an LRT route; this decision will go to the Public Works & Infrastructure Committee on March 4th. Ward 21 cyclists were involved in the Shaw Street contraflow bike lane motion passing at City Council (one block of the contraflow lane is in Ward 21). Jared described Ward 21 Councillor Joe Mihevc as “bike friendly,” but recognized that conditions in the ward could be better. For instance, Jared said, “this winter is proving we have three-season bike lanes,” a reference to some roads, bike lanes, and sidewalks not being cleared of snow and ice. 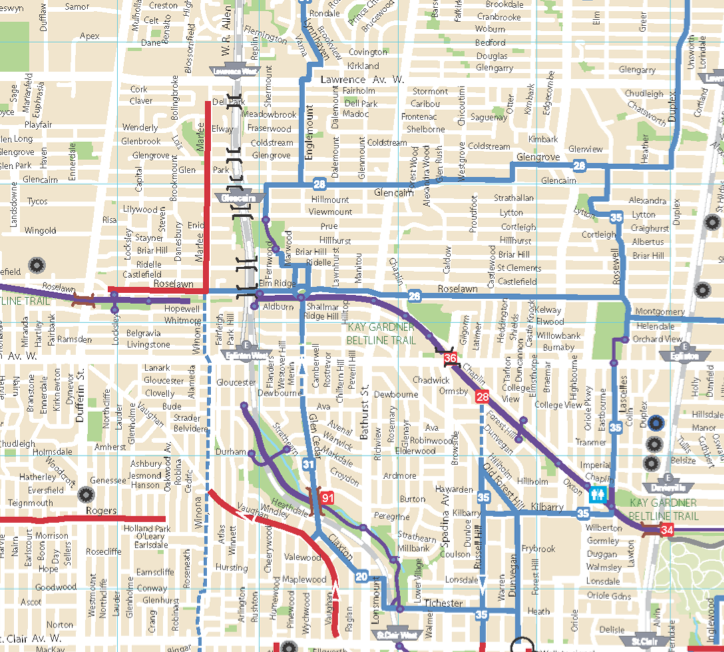 It was generally agreed that the infrastructure in Ward 21 could be improved upon, from legal crossings on St. Clair to the implementation of bike lanes. Jared (above L-R) with Ward 22 captain Michael Black and Ward 21 captain Neil McDermott. Jared indicated that this first meeting of 2014 represented a great core for moving forward: setting up the group, establishing regular meetings, reaching out on social media, and strengthening Cycle Toronto’s website. 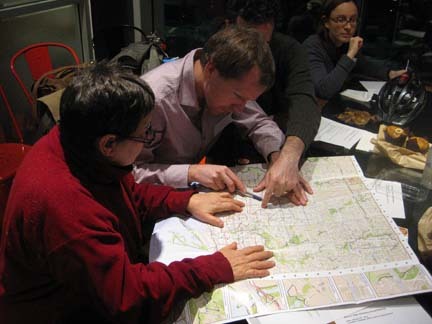 Cycle Toronto’s database shows that there is a large contingent of members in this ward, many of whom have expressed interest in the ward advocacy program. The meeting attendees were a mixture of regular commuter cyclists and those who combine cycling with the TTC. 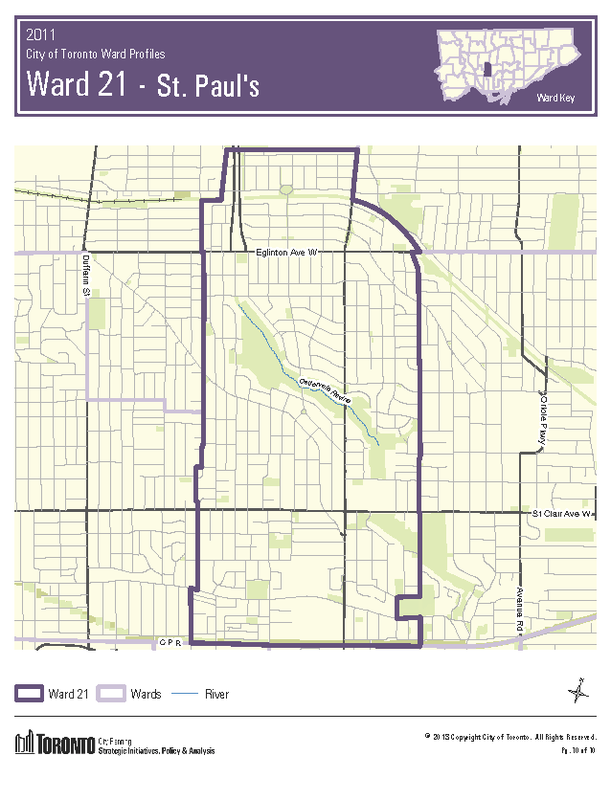 Ward 21 has a range of commuting options, including the ravine system, but gaps exist in routes between the area north of St. Clair and the downtown core. One attendee remarked that the northbound Vaughan Road bike lane, between St. Clair and Winona Drive, is “wedged” between parked cars and moving cars, and stops at the boundary between Wards 21 and 15, just south of a school. She described cycling in the lane as “disconcerting,” with a fear of being doored. We reflected on the results of a Bike Infrastructure Audit that Ward 21 captain Neil McDermott led in September 2013. An audit is a group ride along a set route, determined by the group’s knowledge of areas in need of improvement. Things to look out for include potholes, unnecessary parking, and likely spots for bike lanes. Audits are a great way to determine what we want to advocate for as a ward group. Neil invited Councillor Mihevc and Dan Egan, Manager of Cycling Infrastructure & Programs, to ride with him. Neil argued that we need at least one full bike lane along Glen Cedar Road between Dewbourne Avenue and Eglinton Avenue, already a designated bike route (Route 31). The audit ride was a success, as Councillor Mihevc could immediately speak to what was politically viable, and Egan could comment on what was technically possible. In this screen grab of the Toronto bike map you can see the short break in cycling route 31 on Glen Cedar, just before Eglinton: a Very Small section that would go a long way in creating a complete route for cyclists heading north. As a group, we established specific initiatives for Ward 21 in 2014. A general priority is infrastructure. One member remarked, “The bike lanes don’t go where I need them to go.” We will work to ensure that an approved contraflow lane be installed on Glen Cedar Road, likely in March/April 2014; some residents along Glen Cedar are opposed to the plan. Another project is looking for signs prohibiting left turns during peak hours, for example the one on Bathurst at Tichester Road, and requesting that “bicycles excepted” tabs be added (some have already been approved by council but not installed). In March or April we will hold another Bike Infrastructure Audit, and we invite you to come along for the ride. We will also host social rides this year, perhaps a guided tour of back alleys and a Jane’s Ride telling the story of the Wychwood area. We closed the meeting by dividing into subgroups and assigning responsibilities for action items. If you live in Ward 21 or a neighbouring ward, we invite you to join us. Email ward21@cycleto.ca to be added to our mailing list, and watch for us on Facebook and Twitter (#ward21bikes). Between regular meetings, we will stay connected through email and social media. If you aren’t already a member of Cycle Toronto, consider joining here. If you’d like to be involved in group advocacy for your ward, contact Cycle Toronto, which will be distributing ward advocacy kits. The next Ward 21 advocacy meeting is on Monday, March 3rd, at 7 p.m. Same place: 2nd floor of Loblaw’s on St. Clair at Bathurst, next to the Cooking School. No word yet on whether or not the pianist will also be there.